Portsmouth boss Kenny Jackett labelled the free kick awarded by referee Simon Hooper that ultimately saw his side slip to a 3-2 defeat at Kenilworth Road last night as 'very soft'. 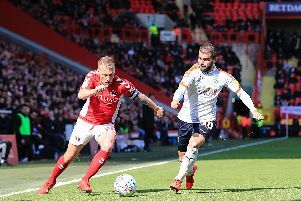 With four minutes to go, George Moncur was felled by visiting defender Anton Walkes just 20 yards from goal, although it appeared he had in fact won the ball. However, Hooper, who had already awarded Luton a penalty when Kazenga LuaLua went over in the box, thought otherwise and whistled for a free kick that George Moncur expertly bent into the bottom corner to win it for Luton. Jackett said: “The free-kick at the edge of the box was soft, very soft, but ultimately then through a lot of bodies, Moncur has struck it sweetly. ‘It was a crucial goal and one we couldn’t recover from. “We just didn’t get the rub of the green with the decisions throughout the game. It happens sometimes – particularly when you’re the away side. “We’ve conceded two goals in the second half from set-pieces. My impression was that it was a penalty, although I felt we should have had one as well. Moncur himself thought it was the right decision on the night though, adding: “I know he got some of the ball, but he took my legs out first, so obviously he went through me to get to the ball. “I thought I was in on goal and I didn’t really see him come across.